Reel Talk Online: "The Town"
"If we get jammed up, we're holding court on the street." Oscar winner Ben Affleck (Good Will Hunting) has had a tough time climbing back to the top after a years-long stint of starring in horrible films. But after his highly-acclaimed 2007 directorial debut Gone Baby Gone, critics and audiences alike began to revisit the phenomenon that is Ben Affleck. This month Affleck continues his streak with his sophomore effort (in which he also stars) The Town, a gritty crime drama centered around a Boston town. The Town follows best friends and bank robbers Doug MacRay (played Affleck) and James Coughlin (played by Jeremy Renner) whose last heist was met with a glitch--better known as Claire Keesey (played by Rebecca Hall), the manager of the bank they knocked off-- of which Doug spends the rest of the movie trying to protect and smooth over. But the more he tries to cover his steps, the deeper he becomes entangled in his own lies and further into the world he perfectly orchestrated along with his best friend, who quickly catches wind that Doug might be trying to come out of the game. Best friends and criminals for years, James is the kind of guy whose heartbeat is rhythmically in tune with the streets of Boston, and he knows that his best friend has that same problem. The two must decide what side of the street they're each on and how to remain alive as the men in blue become hot on their heels in this modern and smart tale of cops and robbers. Renner is gripping as the loose cannon James, even better than he was in The Hurt Locker. Affleck is captivating as Doug, and is a true triple threat as the star, writer and director of a great, heart-pounding film that closely rivals The Departed. Also not to be missed is Gossip Girl's Blake Lively who's jaw-dropping dramatic turn as Krista, James's drug-addicted sister and Mad Men's Jon Hamm as the FBI agent hot on their trail. The Town is a definite must-see. Thanks for posting this rave review Candice. The Town got such a positive buzz here at the Toronto International Film Festival and now I've got to see this movie! This one looked really interesting to me when I first saw the trailer. Nice review, thanks for sharing! I'm glad you enjoyed the performances as much as I did. It's tough for me to say if Renner is better than he was in "The Hurt Locker," but it's definitely a different performance that provides a whole new type of fascination. He nails the tough-guy Boston persona perfectly. 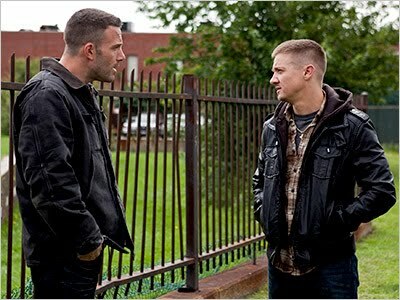 I just saw The Town and LOVED IT! I am stunned that Ben Affleck directed this incredible movie. Seeing it again asap. And you were right Candice about Blake Lively, jaw-dropping performance. Love her!